2005. Photographs by Hardie Truesdale. Text by Joanne Michaels. 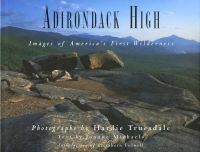 A beautiful photographic album highlighting the remarkable Adirondack Mountain region of New York.. A visually stunning, almost breath-taking tour of this magnificent eastern wilderness region. Hardcover. 128 pp. Shrink-wrapped.